Thank you to everyone who helped to make our April Hunting Tests a success. Once again, we had a great turnout of over thirty GSPCI volunteers for the weekend. We apologize if anyone was inadvertently left out of this report. While the planning and organization of our hunting tests have a blueprint that we follow from year to year, each weekend finds a way to provide unique memories. For me, the highlight of this year’s tests was all the young GSPCI members and handlers that participated. Our favorite club millennials were out in force. Helping out at the score desk were Kate Keenan and Randi D O’Neill. Teaming up to handle the full life cycle of a hunting test quail from planting to gunning were George Noffs and Nathan Selep. Assisting Al Haseman with the grilling were daughter, Kary Haseman and grandson, Zack. Fresh off his final class toward his MSA degree, Matthew Dlugie furthered his education with a grilling 101 lesson on Saturday afternoon from GSPCI’s PhD of Grilling, Professor Al Haseman. Keeping grandpa, John Morrison company and learning how to plant birds was grandson, Colt. Rounding out our youth brigade were Melissa Bivolarov, and brothers, Judah and Levi Singh. Passing her third leg as a junior handler was Myah Landolina. Work for the weekend began in earnest Friday afternoon with the delivery of the club trailer by Trailer Wrangler and Course Designer, Chuck Horvath. Assisted by Mike Karcz, test Chairman Dave Wolfe and Secretary Perry Dlugie made quick work of the course and building set up. Mike put in a full weekend’s worth of volunteering, helping on Saturday and returning to help clean up on Sunday afternoon. Judges for the weekend were Lynne Strelow of Markeson, WI on both Saturday and Sunday, Bill Padovano of Morris on Saturday and Mary Cernak of Manhattan on Sunday. We were fortunate to have these experienced and respected teams to evaluate our dogs and their handlers. GSPCI Hunting Test Director, Frank Susi worked with Dave Wolfe early each morning to ensure that our course was ready for our volunteers and seeded with quail for the dogs and their handlers. Pulling double duty as test Captain of Guns, Frank’s team for the weekend included top notch distributors of lead shot, Nathan Selep, Hank Freitag, Dave June, Jacob Schatz and Chuck Graack. Greeting each and every handler, GSPCI’s Queen of the Parking Lot, Merri Odell is a legend when it comes to keeping everyone on their toes and at the start line on time. Teaming up with Merri was long time Line Marshal, Steve Selep. On hand to assist by marshaling galleries in the field and running scores to the desk were Andy Caron and Steve Odell. Recording scores, awarding ribbons and making everyone feel welcome were our weekend desk staff of Scott Ludwig, Kate Keenan, Zoraida June, Melissa Bivolarov, Randi D O’Neill and Tony Mattingly. Although no one is sure exactly what it is that either of them does, club secretary, John Singh and test secretary, Perry Dlugie were on hand and doing their best to appear busy. No one was fooled. 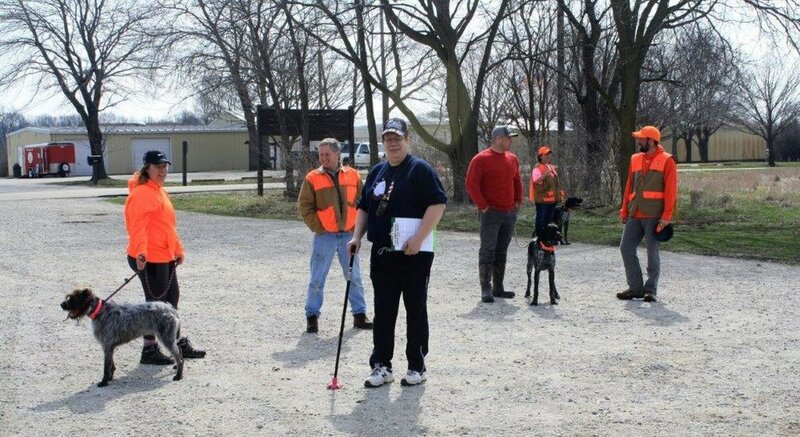 When not in the field trying to keep up with his dogs, committee member, Dennis Nowak was available to assist wherever needed. Holding court near the score desk, making everyone feel welcome and sharing his decades of experience and stories was long time GSPCI and former board and committee member, Paul Kosowski. Perhaps the best spot to watch the action is at the edge of the field in the gunner’s tent. Sharing space with our gunners are GSPCI’s finest, our Avian Placement Specialists. Regardless of the weather, this hard-working crew covers the field from corner to corner strategically distributing quail for the dogs to hunt. Our APS for the weekend included committee member, Ivan Bivolarov and daughter, Melissa, Frank Susi, Dave Wolfe, John Morrison and grandson, Colt, Marty Kyes, Randi D O’Neill, Tracy and Chris Lewis, Hans Hanson, and Training Director, Christine Selep. With the new site concessionaire not yet in place, Al Haseman once again stepped up to make sure that everyone was provided with a tasty lunch for the weekend. Assisted by daughter Kary, grandson, Zack and Christine and Steve Selep, Al made sure that everyone was well fed and ready for the afternoon’s braces. As is the GSPCI tradition, Saturday night’s cook out was well attended and well stocked with food, stories and camaraderie. Once again assisted by brother, Brad club Treasurer and PhD of Grilling, Al Haseman put out another heapin’ helpn’ of grilled chicken, pork chops and fixin’s that more than satisfied even the largest of appetites. Complimented by a counter full of side dishes and desserts generously provided by many of the folks staying for dinner (thank you to everyone who brought a dish to share) no one walked away hungry! 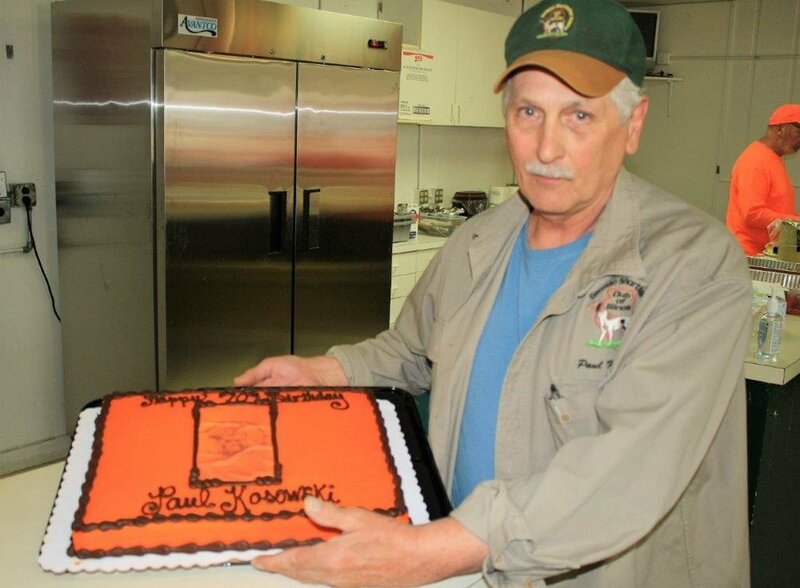 The evening’s festivities included a special cake provided by lady friend, Linda Doak to celebrate Paul Kosowski’s 70th birthday. Adding to Paul’s surprise was when he found out that had unknowingly carried in the well disguised cake from their truck. We sincerely thank all the handlers, volunteers and friends who stopped by to enjoy the weekend. We also thank Purina Pro Plan and Terry Trzcinski for providing handler’s gifts and their continued support of our club. We take great pride in putting on well-organized and welcoming tests and thank all of you who help to make that possible. We look forward to seeing you at the new May 4, and fall tests on September 14 and 15. In the meantime, be sure to check the club website at GSPCI Event Photos for pictures from the weekend along with updates on upcoming events.